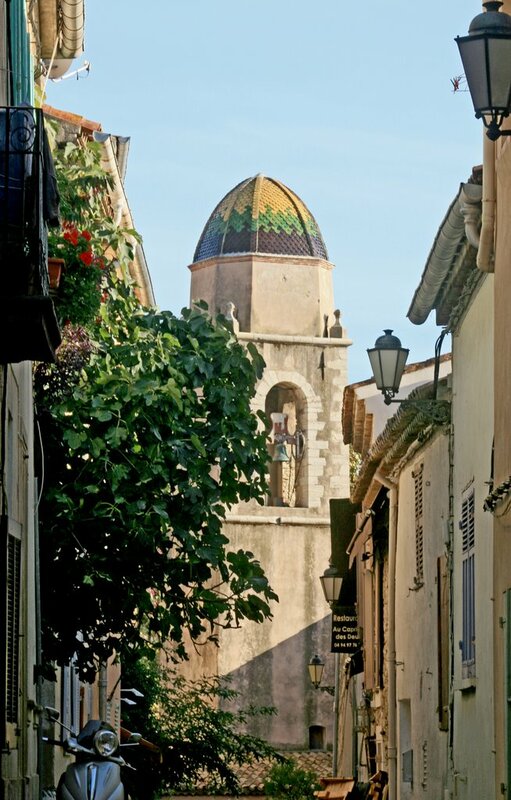 The Annonciade Museum (« le Musée de l’Annonciade »), renowned as one of the most charming in France, is a constant reminder of the renewed history of Saint-Tropez from the beginning of the 20th century. It is Paul Signac who, discovering this small fishing port of his yacht the Olympia in the year 1892, established its prominence. Even though he had purchased a house in the village, which he will later make his workshop, this one will become one of the most active leading-edge centers of the pictorial creation. This house, La Hune, from that time received many of its illustrious painters, among them Marquet, Matisse, Cross, and many others. The collections which succeeded until 1950 are splendid. The work of all the artists who exhibited have shown consistency when you study them. It is therefore through color that they are distinguished, while remaining faithful to figuration and cubism. It is a coherence of painters of the highest quality who make up this group, drawn from the pointillist movements, nabis and fauve. More than twenty paintings are exhibited, all of international standing. The museum is open from Tuesday to Sunday from 10am to 1pm and from 2pm to 6pm. The Butterfly House (« la Maison des Papillons »): It is an impressive collection, with 20,000 world species displayed in a true Tropezian style house. In 2015, Dany Lartigue renovated it in a very original fashion. 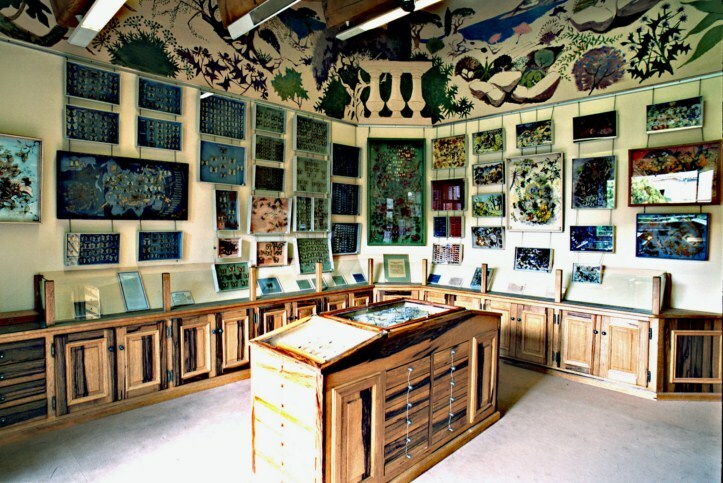 The museum’s home-shop area was then furnished and a workshop was then open to the public. It offers a layout worthy of this extraordinary collection of butterflies from all walks of life detected by the entomologist. A multi-faceted artist, we often meet Dany Lartigue on the edge of the old port alley, with a net in his hand. The museum is open from Tuesday to Saturday from 2pm to 5pm. The Museum of the Gendarmerie and Cinema (« Le Musée de la Gendarmerie et du Cinéma »): No one can ignore the fact that between Saint-Tropez and the Cinema it has been very beautiful love story that has grown, especially when they were associated with the Gendarmerie for the famous saga of the Gendarmes. The museum is located near the splendid Hôtel de Paris, which was completely renovated and opened in late June 2016. Everyone will remember the numerous scenes, shot by the famous team of the Saint-Tropez Brigade from 1979 until 2013. This then became an emblematic venue, after having fulfilled public functions since 1838. When you first walk in you are given an explanation on the representation of Gendarme (The constable), and then on the global History of Cinema in Saint-Tropez. 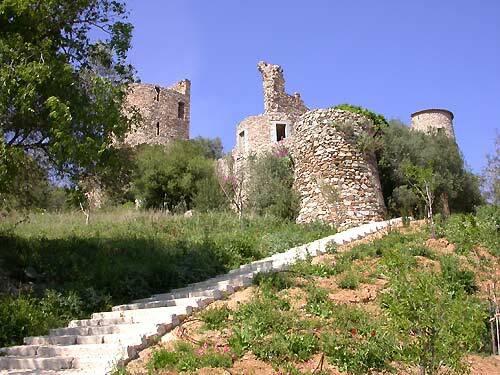 This area shows you a whole host of achievements that were shot in the Peninsula of Var. The various professions related to the cinema are honored there, without forgetting the icon of these mythical venues, the sculptural Brigitte Bardot. After having learned the ropes, with accomplishments such as « La Servante de Jean Choux » in 1930, or « Pour un Soir » by Jean Godard in 1931, she became an international star in the famous « And God Created Woman » by Roger Vadim, her first husband. The museum is open daily from 10am to 8:30pm. Cette entrée a été publiée dans English le 25 septembre 2017 par Boutemyblog. Le Sentier du Littoral Tropézien est l’itinéraire touristique privilégie par les randonneurs. « Recommandé Millésime 2017 » par les guides du Petit Futé, il est devenu une destination incontournable pour les mordus de l’escalade et de la marche à pied. Vous pourrez également découvrir ce sentier de 20 kilomètres au travers de visites guidées, incluant des balades à cheval ou avec un âne pour monture. En empruntant ce sentier, vous marcherez dans les pas des douaniers, qui en des temps anciens surveillaient la côte de Saint-Tropez à Cavalaire. Rien de tel qu’une belle journée printanière pour vous engager dans un territoire où végétation luxuriante et vestiges historiques règnent en maître. C’est l’occasion rêvée de faire la découverte avec le patrimoine culturel varois et de profiter des richesses d’un territoire naturel préservé. Montrez-vous avisés et munissez-vous de bonnes chaussures de marche, sans oublier pour autant de prévoir un incontournable pique-nique, idéal pour les amoureux de la nature. Au départ de la Tour du Portalet, en direction des vieux quartiers aux pieds de la Citadelle, c’est les yeux face à la mer que mène le célèbre sentier. Vous pourrez contempler les caps et les pointes de la campagne tropézienne environnante. En vous engageant plus avant, dès après avoir foulé la plage de Tahiti, vous longerez la vaste baie de Pampelonne. Des lieux idylliques qui vous feront retrouver le sentier à proprement parler de « Bonne Terrasse ». Ne vous reste ensuite qu’à grimper pour atteindre le Cap Camarat, avant de redescendre pour aborder la plage de l’Escalet. De là les rochers surplombant la mer donnent de plein fouet sur le domaine du massif sauvage des Maures de Cap Lardier. Les Caps Taillat et Cartaye ne sont pas en reste pour autant, c’est une vision des plus saisissantes qui s’offre alors à vos yeux ébahis. A noter que la plage des Canebiers tire son nom des plantations de chanvre aux abords (un canebier étant un vendeur de chanvre). Elle servit en outre de mouillage aux navires en transit. Quant au Cap Saint-Pierre, sa notoriété lui vient du privilège de positionnement sur les hauteurs de la plage des Canebiers. Idéalement située pour observer la circulation maritime, elle permettait de contrôler si des contrebandiers y accostaient. Autres points de vue immanquables : La plage de la Moutte pour sa part se singularise par un pan, à une de ses extrémités, d’un vestige de mur d’une ancienne madrague. Un îlot rocheux se trouve au large de la Croisette, offrant une vue époustouflante sur l’Esterel et jusqu’aux Alpes par temps clair. Concernant la plage des Salins, son rivage retient encore les vestiges du corail jadis pêché sur les récifs rocheux. Un îlot s’y profile dans le lointain, c’est celui de la Tête de Chien, qui vit autrefois s’échouer plus d’un navire. A l’arrière de la plage un étang saumâtre, vestige d’anciens salins, liseré d’ajoncs et de cannisses. Nous vous souhaitons une excellente randonnée! Cette entrée a été publiée dans Golfe de Saint-Tropez le 21 septembre 2017 par Boutemyblog. This article is the second one of a series of articles about Saint-Tropez. 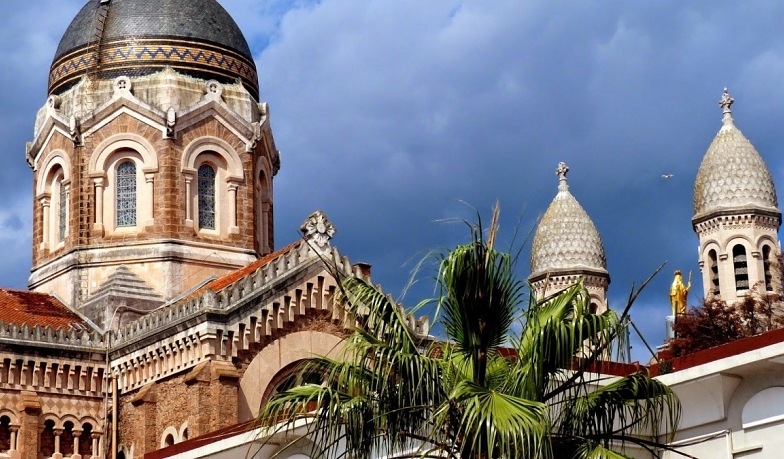 You can also read about the magnificence of numerous religious monuments of Saint-Tropez on our blog. The beach of Pampelonne welcomes 30,000 visitors each day in the summer, 500 registered movements of vessels during the afternoons of August … for a turnover of €40M , that is generated from 35 beach hotels around the seaside. And what a beach! With its 4.5 km of fine sand and its classification « Outstanding natural site », it is actually one of the famous myths so dear to the Tropezians. It is the ideal place for sunbathing, relaxing with dignity, swimming and dancing. It is undoubtedly the most recognized in the Var. However, it remains largely accessible to the public and has preserved its style without allowing their success change them or be embarrassed by urbanization. Naturally sheltered from the mistral and in the absence of road facing the sea, canes and vines brighten up your leisure. For more than 60 years, numerous beach hotels have ensured they are renown and rewritten their history: Club 55, Tahiti Plage, Aqua club or even Moorea without forgetting the Nikki beach, a worthy successor to the Voile rouge. Brigitte Bardot and Roger Vadim, Gilbert Becaud, Michèle Morgan, Elton John, Claudia Schiffer and Johnny Hallyday or recently Tony Parker and Paris Hilton, have made visits to these clubs. Noting that, for lodging the crew of the film « And God created woman », from simple canteen Club 55 has transformed into a reputable restaurant. 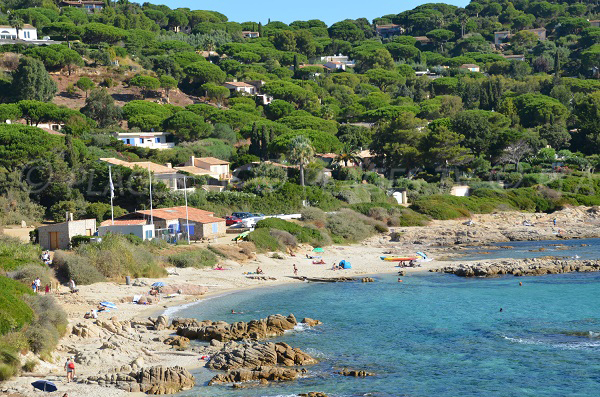 The beach of La Ponche and the beach of Fontanette: These are two adjoined beaches, which are located near the oldest neighborhood of Saint-Tropez. It is renowned for welcoming youngsters on vacation in the summer thanks to popular and traditional festivals. But you can also enjoy the pleasure of walking on the granular sand or to swim at the very feet of the fishermen’s houses. In the shelter of its walls Saint-Tropez protects a legendary hotel, « La Ponche », just as charming as discreet. Many film scenes have been shot here, through which the actors were made immortal. The great Françoise Sagan said, « I got up from my bed, I opened the shutters and the sea and the sky threw in my face the same blue, the same pink and the same happiness ». It was like time remained still temporary suspended, flirting between the boisterous twist of a blessed era and the delightful sweetness of his living paintings. It is not our national icon Brigitte who will disagree nor would Jacques Cordier, the painter whose heightened sensitivity has disappeared today. The beach of L’Escalet is not the easiest to find on Ramatuelle (just beside Saint-Tropez) but it is nonetheless one of the most pleasant. Well located between Cap Taillat and Cap Camarat, following the avenue of Casabianca, then that of the Escudelier, leading you to the parking lot. It is interesting to know because from there it leads to alternating sand and coves. Wonderful beaches on the outskirts where having picnics is a sheer delight. Dogs kept on a leash are allowed and during the summer period the beach is under surveillance. Do not forget to bring walking shoes as there are sites to explore, notably the stroll of the Good Bay (« La Baie de Bon »). The vegetation is very dense and lush, reasons why nudism has become common practice. A bewitching forest, where cactus grow up exquisitely in abundance and the cicadas enchant you. Te pines immerse themselves for their delight, while a few steps away you can swim in an ocean worthy of the Caribbean. Cette entrée a été publiée dans English le 19 septembre 2017 par Boutemyblog. Le musée de l’Annonciade, réputé pour être l’un des plus charmants de France, est un rappel sans cesse renouvelé de l’histoire de Saint-Tropez des débuts du XXème siècle. C’est Paul Signac qui, découvrant ce petit port de pêcheurs de son yacht l’Olympia en l’an 1892, en assoit la notoriété. Se portant acquéreur d’une maison dans le village, dont il fera son atelier, celui-ci deviendra l’un des foyers avant-gardistes des plus actifs de la création picturale. Cette maison, La Hune, reçut dès lors en son sein nombre de peintres déjà illustres, dont Marquet, Matisse, Cross etc. Les collections qui se sont succédées jusqu’en 1950 sont splendides. Le travail de l’ensemble des artistes qui ont exposé ont fait montre de constance dans la réflexion. C’est donc au travers de la couleur qu’elles se distinguent, tout en demeurant fidèles à la figuration et le cubisme. C’est une cohérence de peintres de tout premier ordre qui forment cet ensemble, tiré des mouvements pointillistes, nabis et fauve. Plus d’une vingtaine de toiles sont donc exposées, toutes de notoriété internationale. Le musée est ouvert du mardi au dimanche de 10h00 à 13h00 et de 14h00 à 18h00. La Maison des papillons : C’est une collection impressionnante, recensant pas moins de 20 000 espèces mondiales, qui se trouvent réunies dans une habitation 100% de style tropézien. En 2015, Dany Lartigue lui apporte du renouveau, dans une présentation pour le moins originale. L’espace accueil-boutique du Musée fut pour lors aménagé et un atelier s’est ainsi trouvé ouvert aux publics. Il offre une présentation digne de cette extraordinaire collection de papillons issus de tous horizons découverts sa vie durant par l’entomologiste. Artiste aux mille et une facettes, on rencontre souvent Dany Lartigue aux abords de la ruelle du vieux port, un filet à la main. C’est que le Massif des Maures regorge de richesses, auquel il a porté sa propre touche en préservant, au travers de ses toiles, les réalités de la vie quotidienne. Le musée est ouvert du mardi au samedi de 14h00 à 17h00. Le Musée de la Gendarmerie et du Cinéma : Nul n’est censé ignorer qu’entre Saint-Tropez et le Cinéma c’est une bien belle histoire d’amour qui s’est tissée, surtout quand ils furent associés à la Gendarmerie pour la célèbre saga des Gendarmes. De là à ouvrir un musée en leur honneur le pas fut vite franchi ! C’est aux proches abords du splendide Hôtel de Paris, pour lors entièrement rénové, qu’il a ouvert ses portes en fin juin 2016. Chacun se souviendra des nombreuses scènes, tournées par la célèbre équipe de la Brigade de Saint-Tropez de 1979 jusqu’en 2013. Celle-ci devint alors un lieu emblématique, après avoir rempli des fonctions publiques plus terre à terre depuis 1838. D’entrée on vous offre une explication sur la représentation du Gendarme, pour en venir à l’Histoire plus globale de Cinéma à Saint-Tropez. Cet espace vous présente toute une pléiade de réalisations qui furent tournés dans la Presqu’île varoise. Les divers métiers liés au cinéma y sont mis à l’honneur, sans oublier l’icône de ces lieux mythique, la sculpturale Brigitte Bardot. Après avoir fait ses armes, avec des réalisations telles que « La Servante de Jean Choux » en 1930, ou encore « Pour un Soir » de Jean Godard en 1931, ce fut l’apothéose ! Le film de Roger Vadim lui offre définitivement ses titres de noblesse, avec notre B-B nationale dans le premier rôle du célébrissime « Et Dieu… créa la Femme ». Le musée est ouvert tous les jours de 10h00 à 20h30. Cette entrée a été publiée dans Saint-Tropez le 18 septembre 2017 par Boutemyblog. Après un premier article consacré aux monuments religieux de Saint-Tropez, nous vous invitons à découvrir avec nous les pages mythiques de Saint-Tropez. La plage de Pampelonne c’est 30 000 visiteurs chaque jour en été, 500 mouvements recensés de navires durant les après-midis d’août… pour un chiffre d’affaire de 40M€, que génèrent ses 35 établissement de bords de mer. Et quelle plage ! Avec ses 4,5 km de sable fin, et son classement « Espace naturel remarquable », elle est au fait du célèbre mythe si cher aux tropéziens. C’est l’endroit rêvé pour lézarder au soleil, se restaurer dignement, s’y baigner et aussi bien danser. C’est sans conteste la plus connue dans le Var. Pour autant elle reste en grande partie accessible au public et a préservé son cachet, sans prendre la grosse tête ni s’embarrasser de l’urbanisation. Naturellement abritée du mistral, et en l’absence de route en front de mer, cannes et vignes s’égayent à loisir. Depuis plus de 60 ans de nombreux établissements ont assuré sa renommée et réécrit son histoire : Le Club 55, Tahiti Plage, l’Aqua club ou encore Moorea, sans oublier le Nikki beach, digne successeur de la Voile rouge. De nombreuses stars du show-biz ont garanti leur notoriété ! Brigitte Bardot et Roger Vadim, Gilbert Becaud, Michèle Morgan, Elton John, Claudia Schiffer et Johnny Hallyday, ou récemment Tony Parker et Paris Hilton, y ont leurs entrées. A noter que, pour restaurer l’équipe du tournage du film « Et Dieu créa la femme », de simple cantine le Club 55 s’est métamorphosé en un restaurant réputé. 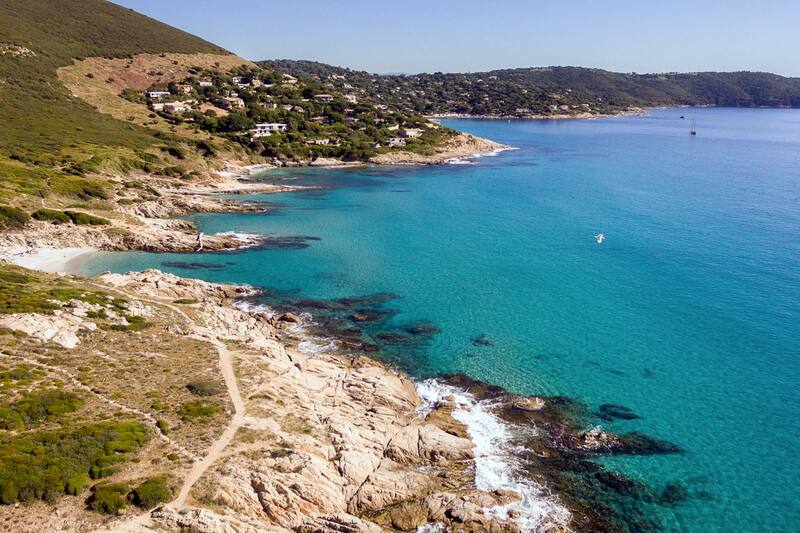 La Plage de la Ponche et la plage de la Fontanette : Ce sont deux plages mitoyennes, qui se situent aux abords du plus vieux quartier de Saint-Tropez. Réputées pour l’accueil des jeunes en loisirs d’été, elles le sont tout autant grâce aux fêtes populaires et traditionnelles qui y sont organisées. Rêvant de tous les capitaines au long cours que la ville leur a apporté, les visiteurs se sentent remplis de nostalgie. Mais vous pouvez aussi goûter au plaisir de marcher dans le sable granuleux, ou vous baigner aux pieds même des maisons de pêcheurs. Ces lieux idylliques ont pour voisins des bars et restaurants à foison, car les souvenirs eux-mêmes ont le tournis dans la cité ! A l’abri de ses remparts Saint-Tropez protège un hôtel légendaire, celui de « La Ponche », tout aussi charmant que discret. De nombreuses scènes de films s’y sont déroulées, au travers desquels les acteurs ont été rendus immortels. La grande Françoise Sagan en disait « Je me suis levée de mon lit, j’ai ouvert les volets et la mer et le ciel m’ont jeté au visage le même bleu, le même rose, le même bonheur ». Le temps y est demeuré comme suspendu, flirtant entre le twist endiablé d’une époque bénie et la douceur ravissante de ses tableaux vivants. Ce n’est pas notre Brigitte nationale qui démentira, pas plus que Jacques Cordier, ce peintre à la sensibilité exacerbée aujourd’hui disparu. 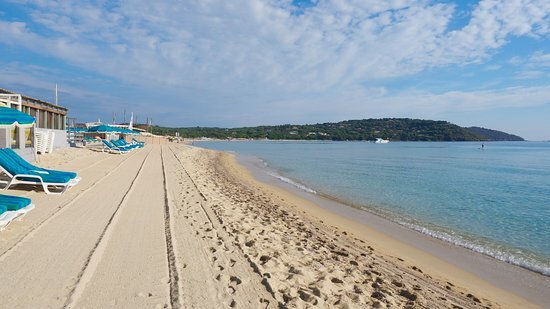 La plage de L’Escalet n’est pas la plus facile à dénicher sur Ramatuelle (juste à côté de Saint-Tropez) mais elle n’en demeure pas moins l’une des plus agréables. Bien située entre le Cap Taillat et le Cap Camarat, en suivant l’avenue de Casabianca puis celle de l’Escudelier, vous arrivez au parking. C’est intéressant à savoir car de là on débouche sur une alternance de sable et de criques. Des plages paradisiaques aux abords où pique-niquer est un pur délice. Les chiens tenus en laisse y sont acceptés et durant la période estivale, la plage est placée sous surveillance. N’oubliez pas de vous munir de chaussures de marche tant il y a d’espaces à parcourir, notamment la promenade de la Baie de Bon. La végétation y est très dense et luxuriante, raisons pour lesquelles le nudisme est devenu pratique courante. Une forêt ensorcelante, où poussent à foison des cactées de toute beauté, tandis que les cigales vous enchanteront de leur parade cymbalistique. Les pins où elles s’immergent font leurs délices, tandis qu’à deux pas vous pouvez vous baigner dans un océan digne de Caraïbes. Les couleurs violentes dominantes n’ont d’égal que leurs contrastes. D’où cet effet que la mer y est d’autant plus bleue, surtout quand elle se mesure aux rochers immaculés, tout faits de douces rondeurs. Cette entrée a été publiée dans Saint-Tropez le 15 septembre 2017 par Boutemyblog. The Basilica of Our Lady of Victory (Notre Dame de la Victoire) is a splendid religious edifice, which was built on Saint-Raphaël at the end of the 19th century. The project of Mayor Félix Martin then in office was to make the city attractive for tourism and more pleasant for its inhabitants to live in. On the request of Abbé Bernard, the project was entrusted to the architect Pierre Aublé who was inspired by the church of Saint Sophia in Istanbul. Its inauguration took place in 1887, on the day when the famous maritime battle of Lepangto was celebrated in 1571. Its elevation to the rank of minor basilica was done on May 16, 2004, attesting to the affixation on its main facade of its coat of arms to the pontifical arms. A title emphasizing its privileged connection with the Holy See, which entitles it to benefit from the Plenary Indulgence, on conditions set by the Church six times during the year. Its mixture of Byzantine style is influenced by Moorish style, judiciously mixed up with a Turkish concept. Built in pink Estelle sandstone, it extends over a surface of 950 m2. Its highest point is 35 meters high and its facade is adorned with a statue of the archangel Raphael, Holy protector of the city. The Chapel of Mercy (la Chapelle de la Miséricorde), was built in the 17th century in the former district of the families of sailors. Built to include a new hospital the monument belongs to the village itself. Its works started in 1635 and its construction was completed only a year later. The mission of the Chapel of the Brotherhood of Black Penitents was to help the sick by visiting them, to also transport the dead and participate in the processions. Its exceptional asset is its serpentine stone door, pulled from a quarry located between Cavalaire-sur-Mer and Croix-Val-mer as well as its bell tower with a glass dome. The feast of the Black Penitents took place on the day of the Candlemas, starting in the year 1656, when the statues of St. Victor and St. Vincent were brought out only for the occasion. Their gaze was directed in the opposite direction so the inhabitants pointed out that « One looks to port and the other to starboard. » The Parish Church was almost destroyed so it wasn’t until 1776 that the Chapel was used for church services, a decision that was very badly accepted by the Black Penitents. When it was purchased by some private individuals in 1808, the sole purpose was to restore its religious purpose by March 24, 1818. The Black Penitents then had it entirely at their disposal until they were dissolved around 1854. The restoration of the Chapel, inaugurated on December 15, 1997 has since ever allowed it to serve as a venue for concerts and exhibitions. The chapel of Sainte-Anne for its part holds its originality to have one foot on Saint-Tropez and the other on Ramatuelle. It is said to have been built around 1618 to thank heavens for having protected the inhabitants of the city from plague epidemics that were frequent at that time. Its construction lasted for more than 10 years and was then dedicated to the patron saint of sailors and all the abandoned people. It is open to the public only on a few days during the year: On May 18th for the Bravade, On July 26th to celebrate Saint Anne and On August 15th which is Assumption Day. It usually accommodates ex-votos, dedicated to the history of the Tropezien sailors. It is a wonderful site to discover due to its exceptional vantage points both on the cove of Pampelonne and on the Bay of St-Tropez. A place for strolls and contemplation, conducive for meditation as well as celebrations. Cette entrée a été publiée dans Golfe de Saint-Tropez le 13 septembre 2017 par Boutemyblog. cet article sera le premier d’une série d’articles consacrés aux excursions à faire, monuments à voir et animations autour de Saint-Tropez. Nous espérons qu’ils vous permettront d’organiser votre séjour dans la région, que ce soit pour un week-end ou une semaine de vacances. La basilique Notre Dame de la Victoire est un splendide édifice religieux, qui fut construit sur Saint-Raphaël à la fin du XIXème siècle. Le projet du Maire Félix Martin, alors en fonction, était de rendre la ville attractive pour le tourisme et plus agréable à vivre pour ses habitants. Sur la demande de l’abbé Bernard, le projet fut confié à l’architecte Pierre Aublé, qui s’inspira pour l’occasion de l’église Sainte Sophie à Istanbul. Son inauguration s’est tenue en 1887, date ou fut commémorée la célèbre bataille maritime de Lepangto qui se déroula en 1571. Son élévation au rang de basilique mineure fut rendue effective au 16 mai 2004, en atteste l’apposition sur sa façade principale du blason aux armes pontificales. Un titre soulignant son lien privilégié avec le Saint-Siège, et qui lui donne droit à bénéficier de l’Indulgence Plénière, aux conditions fixées par l’Eglise, six fois durant l’année. Son mélange de style byzantin est d’influence mauresque, judicieusement mêlé à un concept turque. Construite en gré rose d’Esterel, elle s’étend sur une superficie de 950 m2. Son point culminant s’élève à 35 mètres de hauteur et sa façade est ornée d’une statue de l’archange Raphaël, Saint protecteur de la ville. La Chapelle de la Miséricorde, a été bâtie au 17ème siècle dans l’ancien quartier des familles de marins. Construite pour inclure un nouvel hôpital, le monument appartient au village en lui-même. Ses travaux ont commencé en 1635 et son édification s’est achevée un an plus tard seulement. La Chapelle de la Confrérie des Pénitents Noirs avait pour mission de porter aide aux malades en les visitant, voire à transporter les morts et participer aux processions. Son atout exceptionnel est sa porte en pierre serpentin, tirée d’une carrière située entre Cavalaire-sur-Mer et la Croix-Val-mer, ainsi que son clocher au dôme vitré. C’est le jour de la Chandeleur qu’avait lieu la fête des Pénitents Noirs, à compter de l’an 1656, qui pour l’occasion sortaient les statues de Saint-Victor et Saint-Vincent. Leurs regards étant dirigés en sens inverse, les habitants firent remarquer que « L’un regarde à bâbord et l’autre à tribord ». L’Eglise Paroissiale menaçant de tomber en ruine, ce n’est qu’en 1776 que la Chapelle servit pour les offices, décision qui fut très mal acceptée par les Pénitents Noirs. Quand en 1808 elle fut rachetée par des particuliers, c’est à seule fin de lui rendre son usage religieux au 24 mars 1818. Les Pénitents Noirs en retrouvèrent alors l’entière disposition, jusqu’à leur dissolution vers 1854. La restauration de la Chapelle, inaugurée le 15 décembre 1997, lui permet depuis de faire office de lieu de concerts et d’expositions. La chapelle Sainte-Anne pour sa part tient son originalité d’avoir un pied sur Saint-Tropez et l’autre sur Ramatuelle. Comme pour le Mont Saint-Michel, déchiré entre la Normandie et la Bretagne, chacun souhaite s’en attribuer la domiciliation. Elle aurait été édifiée à compter de 1618 pour remercier le ciel de bien vouloir protéger les habitants de la cité des épidémies de peste fréquentes à cette époque. Sa construction a duré plus de 10 ans, date à laquelle elle fut dédiée à la sainte patronne des marins et de toutes les personnes abandonnées. Elle n’est ouverte au public qu’à raison de quelques journées par an : le 18 mai pour la Bravade, le 26 juillet à l’occasion de la Sainte Anne et le 15 août, jour de l’Assomption. Elle accueille en ses murs des ex-votos, consacrés à l’histoire des marins Tropéziens. C’est un superbe site, à découvrir pour ses points de vue exceptionnels tant sur l’anse de Pampelonne que sur la Baie de St-Tropez. Un lieu de promenade donc et de recueillement, propice à la méditation comme aux célébrations. Cette entrée a été publiée dans Golfe de Saint-Tropez le 11 septembre 2017 par Boutemyblog. « L’imaginaire : Cette force en nous capable de nous faire supporter la réalité trop dure, mais aussi de nous détourner de la vie réelle. L’origine de tant d’imaginations folles et parfois angoissantes mais aussi de pensées nouvelles. Cette source d’illusions mais aussi cette capacité de faire des projets et de créer. Savons-nous faire confiance à notre imaginaire, le critiquer, en accueillir la fécondité ? » Nicole Fabre, psychanalyste de renom, psychothérapeute pour enfant, enseignante et auteur de nombreux ouvrages, appartient à une vieille famille grimaudoise. 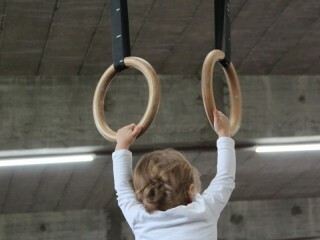 Elle reste fidèle au village où elle passe le plus souvent possible, le temps que lui laisse ses nombreuses occupations. Elle est également la sœur de l’écrivain Suzanne Prou, prix Renaudot, aujourd’hui disparue. Depuis plusieurs années, Nicole Fabre consacre à la commission extra-municipale Grimaud Europe sa première conférence de rentrée. A l’issue de la conférence Nicole Fabre signera son dernier ouvrage : « L’une écrit, l’autre écoute », une réflexion sur sa vocation et celle de sa sœur. ORCHESTRE REGIONAL DE CANNES PROVENCE ALPES COTE D’AZUR Direction : Benjamin LEVY Symphonie n°6 (La Pastorale) de Ludwig Van BEETHOVEN. L’intense activité de l’Orchestre Régional de Cannes Provence Alpes Côte d’Azur lui permet d’être l’instrument vivant et dynamique d’une diffusion musicale et culturelle de haut niveau qu’il développe dans l’ensemble des communes et lieux culturels de toute la région, et de remplir avec talent la mission de service public qui lui est dévolue. 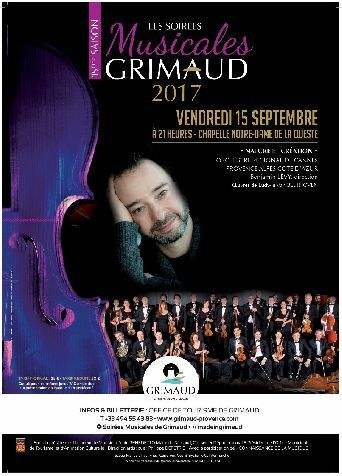 Fidèle partenaire des Soirées Musicales de Grimaud, il se présente sous la baguette de son nouveau directeur musical Benjamin Levy qui, à 42 ans, affiche une formidable expérience forgée à la tête des plus grandes formations européennes. 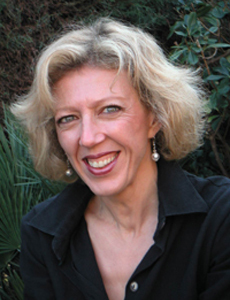 Dans ce programme original figure le poème de la mer et de l’amour d’Ernest Chausson, oeuvre vocale majeure du musicien, servi par la voix somptueuse de la jeune mezzo Pauline Sabatier (à qui l’ADAMI a décerné le prix «Révélation Jeune Artiste Lyrique» et en 2010 qui a remporté le second prix du concours de chant de Béziers) et la célèbre symphonie Pastorale de Beethoven. 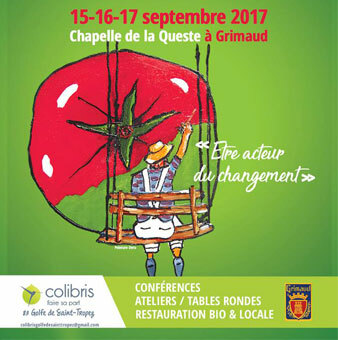 Les 15, 16 et 17 septembre 2017 : Dessine-moi … une tomate ! Parce que chacun d’entre-nous peut devenir acteur du changement, les Colibris du Golfe de Saint-Tropez organisent du vendredi 15 au dimanche 17 Septembre son événement annuel phare : « Dessine-moi une tomate ». Trois jours de rencontres, conférences, tables rondes, ateliers, présentations… Bref : 3 jours de partages pour échanger sur les actions déjà menées ou qui doivent être menées pour protéger la planète, sa faune, sa flore, mais aussi l’Homme. Acteurs locaux et nationaux seront présents pour partager leur engagement avec un public citoyen. Trois conférences majeures auront lieu, avec des invités de marque : Ananda Guillet, directeur technique de Kokopelli, Jean-Pierre Berlan, agronome et économiste, Lamya Essemlaly, présidente du Sea Shepherd France et Gaël Derive, écrivain-documentariste. Des tables rondes thématiques viendront animer les discussions avec la participation de nombreux acteurs du territoire. Transmettre à la jeunesse l’envie d’en savoir plus sur son lieu de vie, voilà une belle ambition ! L’objectif n’est pas seulement de faire acquérir une connaissance, mais aussi de faire comprendre l’importance de respecter ces lieux de vie. Le patrimoine n’est autre que la conjugaison de l’homme et de son environnement. Le naturel devient culturel par un long processus en perpétuelle transformation. 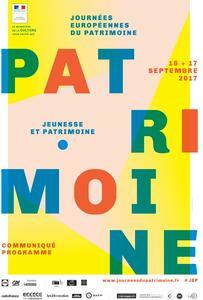 Le patrimoine ainsi constitué appartient à toute l’humanité dont la jeunesse en est le garant. Grimaud s’inscrit dans cette démarche de transmission initiée par l’Etat, en proposant lors de ces journées, des activités ludiques, conviviales et pédagogiques. Mise à disposition d’une « Boîte à Mots », place de l’Eglise, qui sera ouverte à l’issue du week-end. Partagez en quelques mots ce que les monuments grimaudois vous évoquent. Ecrite spécialement pour le lieu et interprétée par la classe junior de l’école de théâtre de Grimaud, cette petite comédie raconte les difficultés auxquelles est confronté un artiste peintre venu chercher le calme au musée et découvrant des personnages d’autrefois, quelque peu envahissants. Venez vous amuser en famille et partez à la découverte des énigmes du château. Une initiation à l’archéologie sera également proposée au pied de ces ruines ancestrales. Voilà cinquante et un ans que Port-Grimaud est né. Son créateur ? François Spoerry, un architecte visionnaire, qui a imaginé cette cité lacustre des temps modernes. Mais qu’y avait-il avant cette réalisation du XXe siècle ? Depuis les temps préhistoriques ces lieux du fond du golfe sont fréquentés. Ce sera l’occasion de découvrir cette riche histoire. Venez découvrir les histoires et anecdotes de la conteuse du village accompagnée du guide du patrimoine. Elles vous feront découvrir la chapelle Saint Roch, le moulin à vent et le vallon du Pont des Fées. Durée de la promenade : 2h30. Prévoir de bonnes chaussures. La fête de la Saint Michel date du Moyen-Âge. Cette fête profane incarnait l’expiration des baux ruraux, d’où l’expression « à la Saint Michel tout le monde déménage ». 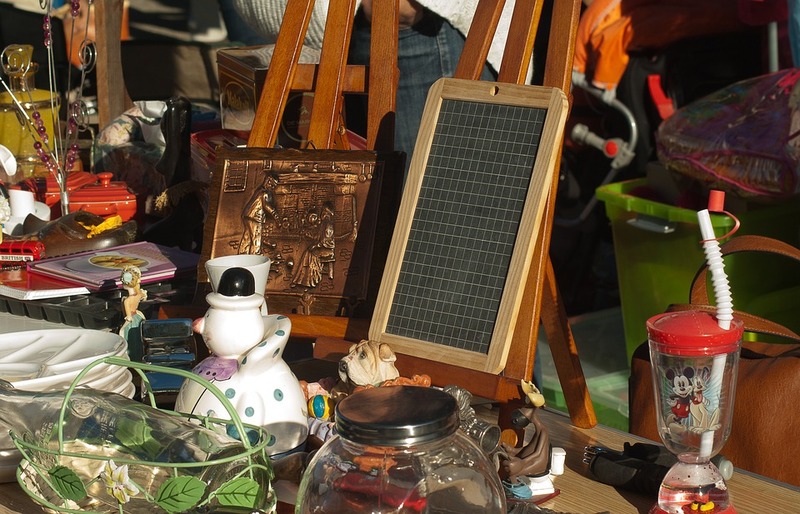 Pour conserver la symbolique de cette fête patrimoniale, un vide-grenier est associé à un marché artisanal sur les deux places de Grimaud. 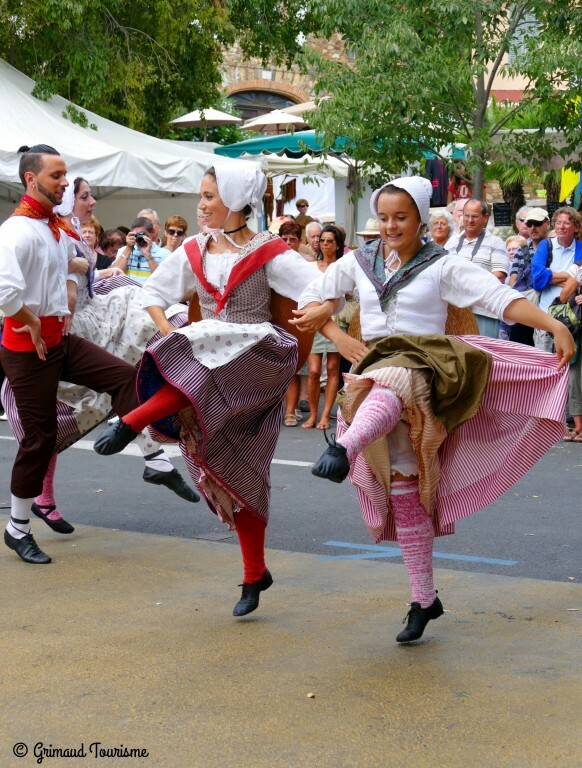 De nombreuses animations (troupe folklorique de l’Escandihado, déambulations musicales, ateliers d’antan, mini-ferme, balades en poney) viennent compléter la Fête. Dans le cadre de la Fête de la Saint Michel, un grand vide greniers est organisé au coeur de Grimaud. Une bonne occasion de vendre ce qui encombre vos maisons. Vêtements qu’on ne met plus, poteries, petit électroménager, disques, objets divers et variés… Tout est bon pour gagner quelques euros dans une ambiance sympathique. Découvrez l’histoire du château, son évolution au cours des siècles. Les résultats des fouilles archéologiques qui se sont succédé apportant leurs lots de découvertes. Cette enceinte fortifiée abritait aussi le village médiéval. Ce sera l’occasion de découvrir son fonctionnement ainsi que l’histoire de la région. Cette entrée a été publiée dans Animations à Grimaud le 6 septembre 2017 par Boutemyblog.